Machine Caps - Dimensional Graphics for Vending Machines. Take advantage of branding opportunities. Machine Caps - Any graphical element requiring additional substrate (top caps, side-view trim caps, etc.) that mechanically mounts to individual vending machines and not the surrounding area facade. Common purposes include company and/or customer branding, or promoting food-service programs. Self-adhesive decals serve a limited purpose - There is only so much area on any machine in which to advertise without interfering with the product display. 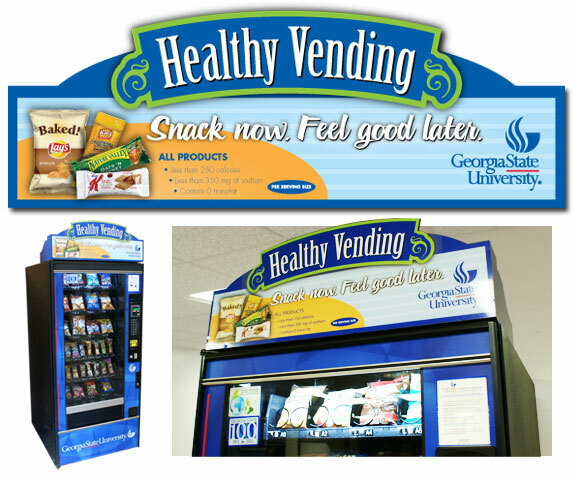 Why not extend your advertising by increasing the overall surface area on a vending machine? 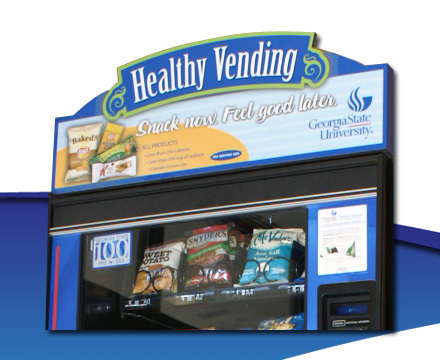 Machine cap promoting a healthy-snack vending machine branded to Georgia State University PMS® colors. Our machine caps apply directly to your machines. This eliminates any issue of attaching anything to your customer's walls. Our machine caps are also designed for your ease of use. You can easily move (or even relocate) each individual machine, and in no way will our machine caps interfere with electronic components, such as WiFi antennas or motion-sensors that activate lighting. Our designers work hand-in-hand with the machine operators and all fabrication artists throughout each step of the production process of every project. The Multiple Media Network offers the best advantages. From initial design concept, throughout production and until completion - we deliver, ready to install. And ready for results. Contact our Graphics Team by selecting the Contact Us - Graphics Division button to the right. Our online form will take a few minutes to complete. This will allow us to best address your needs. A Project Manager from our Graphic Design Department will contact you shortly. View examples of our Design Services using our Online Portfolio. Check out projects from the initial design concept to completed photos in the field. The Multiple Media Network includes graphic artists, production artisans, and fabrication specialists. Our Team works hand-in-hand throughout each stage of every project. This ensures our high-quality results. By grouping projects nationally (raw material costs, maximizing material usage), we are able to offer high-end, yet cost-effective results. Our Graphics Team is often asked to produce "specialty" design projects. In short - if you need to look good, you need us. And we welcome any challenge.